A mere 24 hours after annointing our first Foreign Correspondent - The Right Honourable Patrick Finn of Portland, Esq. - the boy plops THIS into our inbox. In one fell swoop he proves his worth as well as raising the bar for himself. What a copenhagenesque photo, Patrick. Great capture. "Thank you so much for honoring me as your foriegn correspondent, I will not let you down! So long as there are fashionable girls riding bicycles, I will be compelled to photograph them. I have been driving to work more often than not these winter months, which fills me with ennui and pent up energy, but today I was lucky enough to share the road with this lovely cyclista for a few blocks and I was able to line up this shot out my window. You may note the baby blue helmet in her basket. I'd like to think that bicyling isn't so dangerous as to require a helmet, but this cyclist at least carried one with her, maybe to put on as she approached her home to be a good example or to avoid castigation. Get out of yr car and ride your bike. You ain't doing Portland no favors. THis site is a breath od fresh air. It's good to see so many differnat frames out and about. thanks for the comments. for the record we at this blog don't advocate the demise of the automobile. 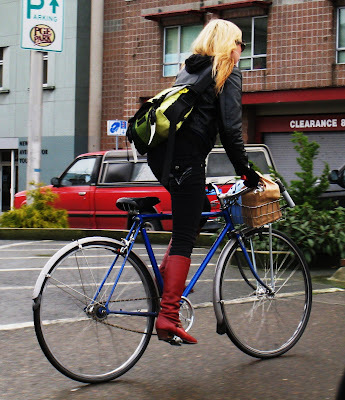 we advocate a vast increase in bike usage but respect the fact that cars are an integral part of society. peaceful coexistence like we have in copenhagen. that's a good start. yes, that saddle is low. mine is low, too [not THAT low] as it's easier to ride around the city, stopping and starting.